LOS ANGELES (AP) — The Los Angeles Dodgers capped a successful homestand Wednesday night by doing something they haven’t had to do often the first week of the season: rally to win. The Dodgers trailed the San Francisco Giants 3-2 going into the seventh inning, but David Freese’s two-run double supplied the go-ahead runs as the Dodgers came back for a 5-3 victory. 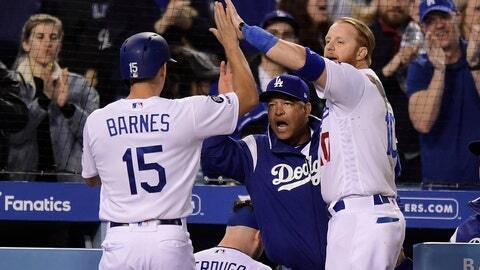 The Dodgers won five of seven on their homestand, and took both games during which they trailed after six innings. “Offense and starting pitching has been great. We’re excited to keep the momentum going and we’re happy where we’re at,” said Cody Bellinger, who has hit safely in all seven games and leads the team in home runs (five) and RBIs (13). Bellinger and Enrique Hernandez each had two hits and drove in a run. Hernandez’s home run in the first gave the Dodgers a homer in their first seven games, a team record to start the season. They lead the majors with 18 home runs, and 30 of their 71 hits have gone for extra bases. Austin Barnes led off the Dodgers seventh with a double and Hernandez walked with one out. After Justin Turner flied out, Freese hit a 2-2 fastball from Reyes Moronta (0-1) off the wall in right-center field for a 4-3 lead. They added a run in the eighth when Bellinger scored on Chris Taylor’s double. Scott Alexander (1-0) got the win in relief, and Kenley Jansen got his third save. The Giants’ bullpen came into the game with the NL’s best ERA (1.50). The three earned runs they allowed in four innings matched how many they had given up in 18 innings in the previous six games. Brandon Belt and Steve Duggar homered for San Francisco and combined to go 9 for 25 with three home runs and six RBIs in the three-game series. The Giants have dropped both series to start the season and are 2-5. Hernandez has hit safely in his last 10 games, dating to Sept. 28 of last season. The second baseman is batting .513 (20 for 39) during that span.